The number of people out of work has dropped by 38,200 since last year – but the country is still two years off full employment. Economist Dan O’Brien said adult unemployment is back at its pre-crash level of 4pc. However, youth unemployment is still well above what it was before the recession. Mr O’Brien said Ireland has not yet returned to full employment. “If it is defined as getting the same share of the adult population into work as was recorded in 2017, it will take two years at the current rate of change,” he said. He said 75pc of adults are at work in the UK, while less than 70pc are in Ireland. A spokeswoman at the Central Statistics Office (CSO) said it was unable to comment on whether the country is near full employment. She said the CSO does not have a definition for full employment and there are varied definitions of the term. 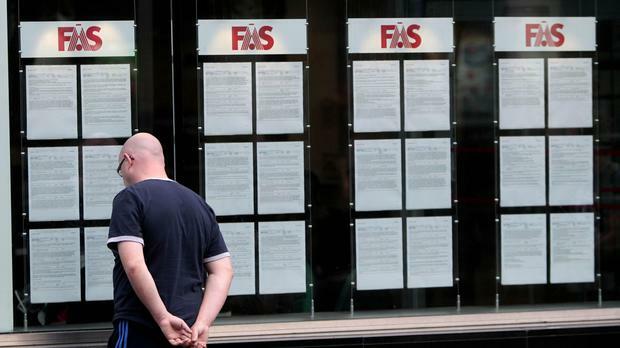 The office’s latest unemployment figures show the rate remained unchanged at 5.1pc in July. There is a general consensus that full employment would mean a rate of around 4pc. According to the figures, the jobless rate has fallen from 6.8pc in July last year. The seasonally adjusted number of unemployed was 120,500 last month, 38,200 down on the same month last year. The CSO said the unemployment rate was 5pc for men in July, down from 5.1pc in June this year, and over 7pc lower than July last year. Among women it was 5.2pc in July, which was unchanged since June. However, women’s jobless rate is down from 6.4pc since July last year. The number of unemployed men was 64,000 in July this year, down from 65,100 in June. However, the number of women who were unemployed was 56,500 last month – an increase of 900 when compared to last June. The unemployment rate for young people aged between 15 and 24 years is almost 12pc.